Mini POE Ethernet Extender AN-LAN-EXT-MINI-POE is a high-speed Ethernet transmission device. It can transmit Power and Ethernet signals together over any pair of 2-wire such as Cat5, coaxial cable and power line, etc. It contains one Master unit and one Slave. The Master can directly supply power for the Slave unit and PoE device. It can be installed in a small space with its compact size. It can transmit IP & PoE over 2-wire such as Cat5, coaxial cable and power line which greatly simplify the project cabling, applied to transmit middle & short distances of PoE device signals. The above data is one-way network parameters. Testing is made under the condition of the cable not fully expanded. There may be differences compared with practical application of the data. Rate is only used as reference in project application. This device can’t support PoE modules power supply, including PoE switch, PoE recorder, etc. It only supports 48-56VDC power input. When you use AN-LAN-EXT-MINI-POE, please follow the below tips as a reference, in order to reduce the fault in the process of using and the inspection work. Every unit device consists of master and slave. Please notice the positive and negative terminal of signal cable when transmit PoE power. Please pay attention to the polarity of the power when the power signal cable is connected to the terminals. Metal wire should be hidden lest happen short circuit to burn out equipments. 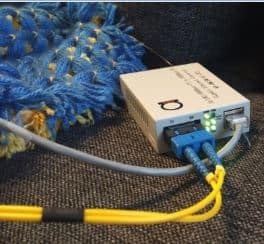 Long-distance cable connections must be by standard connection method, such as welding or using connectors. The coaxial cable, twisted pair cable, telephone line, power line can be sued to transmit the network data signal. Please notice that it may cause the decrease of signal transmission quality if connect kinds of cables at random. Please choose matching power adaptor (12VDC/1A or 48～56VDC/0.8~1.2A). There is no waterproof design for this product, please make sure that it is used in dry environment. Mini POE Ethernet Extender AN-LAN-EXT-MINI-POE is a high-speed Ethernet transmission device. It can transmit Power and Ethernet signals together over any pair of 2-wire such as Cat5, coaxial cable and power line, etc. It contains one Master unit and one Slave. 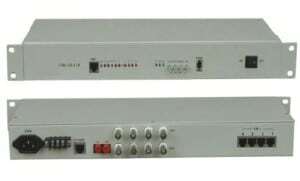 The Master can directly supply power for the Slave unit and PoE device. It can be installed in a small space with its compact size. It can transmit IP & PoE over 2-wire such as Cat5, coaxial cable and power line which greatly simplify the project cabling, applied to transmit middle & short distances of PoE device signals.